Hello everyone, I am here to share a mixed media piece with you today. 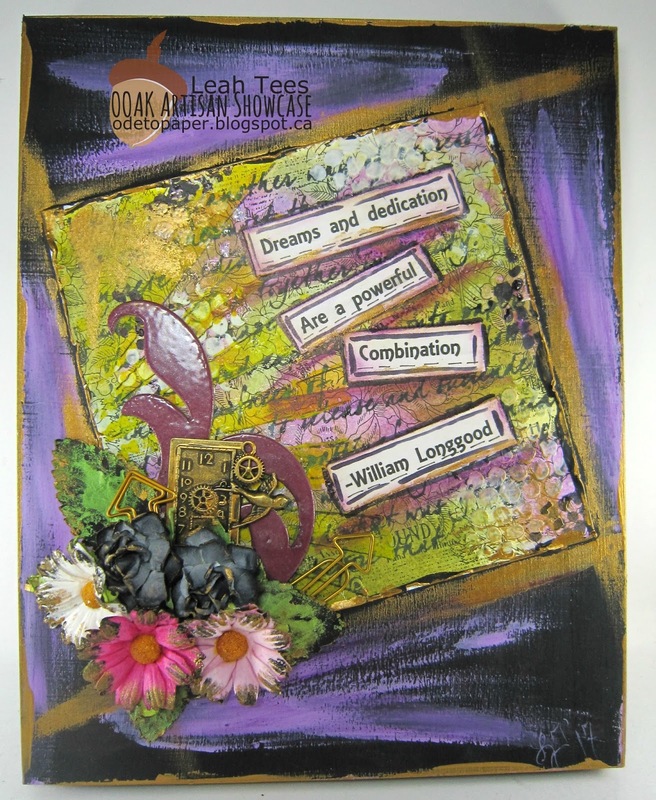 I created this piece using black gesso, Tim Holtz Distress Crayons, acrylic paint, Prima Marketing Paintables (watercolor paper pad) and some flowers and embellishments from my stash. Of course, I used several stencils and colors in this piece, I am learning to put my stencils to good use! This project started out as a 6x6 piece of watercolor paper, and grew into an 8x10 mixed media piece on wooden art board. I loved being able to keep adding to it until I felt it was just the way it should be. That's what appeals to me about mixed media and assemblage (another form of art that I absolutely adore). I am just beginning to learn my way with mixed media, but I love anything that allows me to make something colorful and that makes people smile. OOAK Artisan Showcase will be featuring the wonderful art works of various artists on our new Design Team, and we will also be featuring OOAK members every month, doing product recaps and featuring guest designers! If you are interested in any of these things, please follow along with us! You can also contact us if you have further questions, by emailing me (Leah) at leah@ooakartisans.com or Shelley (our fearless leader) at sgt@ooakartisans.com. This Friday, we will be doing a Design Team member in-depth feature of Jean Stambaugh Peter! She will also be introducing her project next Tuesday, so we hope you will join us again! Leah, this is fab! I live the quote, too. How true!